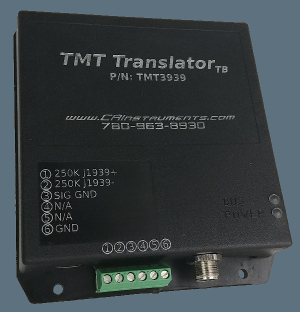 The TMT3939 TranslatorTB is ideal for applications which combine engines, cabs, diagnostic tools, instruments, etc. with different versions of J1939. New installer features—Aid Installation. Minimize Downtime. With one TMT3939 translator, you can seamlessly connect a J1939-250K data bus and a J1939-500K data bus together, and your devices won't know the difference. The J1939 protocol has been universally adopted in the heavy diesel industry for over a decade, but has recently started being phased out by components which support only the newer and faster J1939 500K protocol, showing up in vehicles and equipment as early as 2016. The new protocol's increased speed and capacity come at the cost of being incompatible with the older and more prevalent J1939 250K protocol. This makes combining components such as ECUs, ABS modules, instrument clusters, etc. impossible unless they a) all use the same protocol, or b) are connected together using a TMT3939 translator. Need to Translate J1939 to J1708? Interfacing to a Maretron J2K100? Visit the Maretron knowledgebase.